A big outdoor rug would ground everything on the porch and help create an outdoor room to enjoy with the new view. 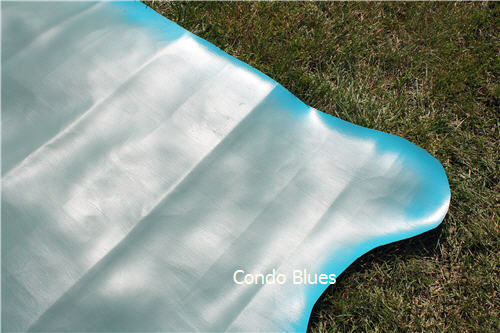 I priced large outdoor bamboo rugs. Did you hear that? That was the sound of my wallet groaning at the price of the rug I liked. I had a small roll of vinyl flooring the builder left us in the For The Love of Mike, Donate This Junk to The Restore Already! pile. You most likely don't have anything remotely similar in your neat and tidy houses, I am sure. I painted two coats of outdoor green paint leftover from my porch chair revamp project on the backside of the vinyl floor covering. This will be the top of my vinyl floor cloth/outdoor rug. I drew and cut a few designs from scrap paper before I cut anything for keeps. Next, I traced a plate to round the corners I free handed the rest of the design. I cut along the lines with a pair of supposed to cut through everything scissors. My regular dishes are not round. This lone paper plate is the only round plate I have. 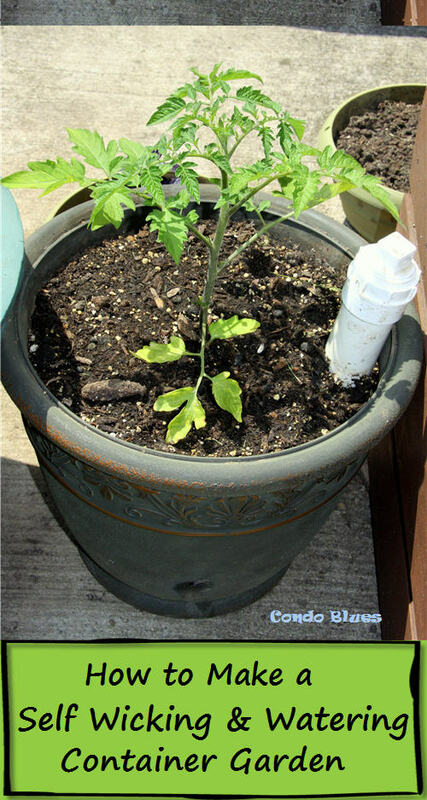 I composted the plate when I finished the project. I used the cut end of the rug as a pattern to trace the design on the other parts of the floor cloth. I’m feeling clever I came up with this idea to ensure everything is symmetrical. I am getting miles of use out of that $5.00 gallon of oops paint, I tell ya! 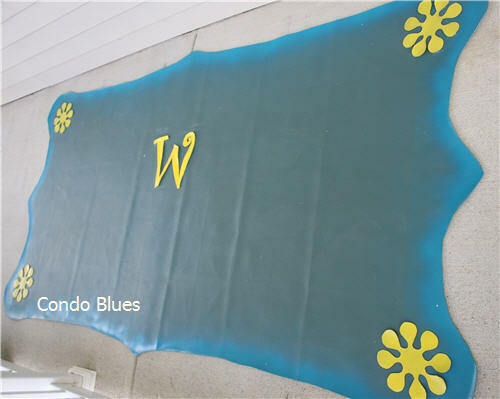 I free handed spraying the edge of the floor cloth with Lagoon spray paint I had left over from my building tepee garden trellis and painted doormat project. I'm pleased with the gradient effect on the border. Even though I know many of you try to avoid hunks of extra plastic, I highly recommend buying a spray paint trigger. Using a spray paint trigger not only saves me from a painful case of Spray Paint Finger but allows me to spray a more even coat and amount of paint on my projects. I think I use less paint on a project with a spray can handle than without. To me, it is worth having. As always, your mileage may vary. I wanted to add a pop of color to the center of my floor cloth. I didn’t want to take a chance on ruining my floor cloth with a stencil mishap when it was so close to being finished. I made paper patterns of a W and retro shapes in Photoshop. I used the patterns to cut the items out of the remaining bits of vinyl. 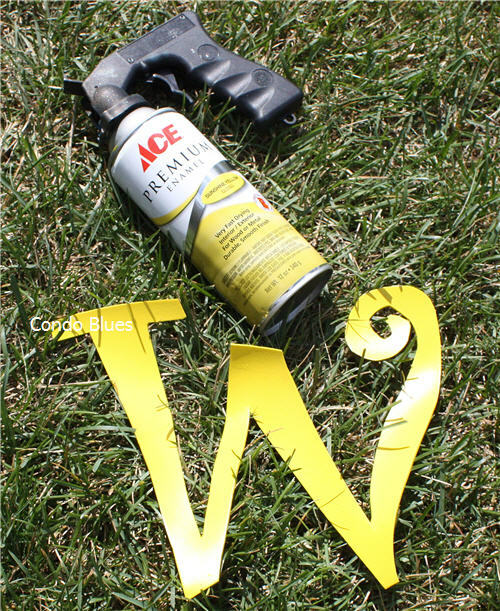 I bought a can of yellow spray paint from Ace Hardware that matches the fabric on the porch chairs using an ACE Hardware gift card Craftsman tucked in my gift bag after teaching at the Craftsman Blogger Summit last July (Thanks guys!) and painted the vinyl cut outs. I glued the yellow vinyl appliques to the floor cloth using E6000 glue. 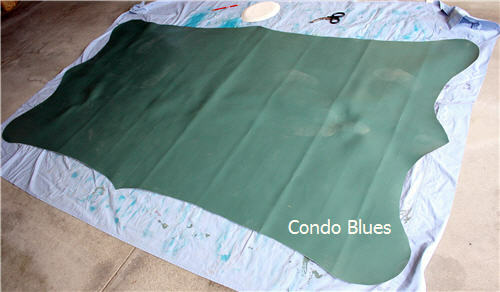 After the glue dried, I protected the floor cloth from the elements with a spray sealer. Lisa's appliques look good but I make them look better! The colors in the floor cloth tie the chairs, tables, and new Lagoon porch and garden accents together for zero dollars. Keeping that vinyl out of the landfill? Priceless! My Power of Paint Porch Remodel is almost complete! I need to shop the house for accessories before next week’s big reveal! Stay tuned! What fun! Love the way it turned out! So practical and fun! Your pup seems to approve. I love the shape of the rug! Neat porch rug and your garden looks lovely! Love the colors you picked for the rug! It's darling! I love making floorcloths outta old lino. The appliques are awesome - gotta try that! What a great idea! I love how you used a floor cloth, very clever! The color is fantastic as well! 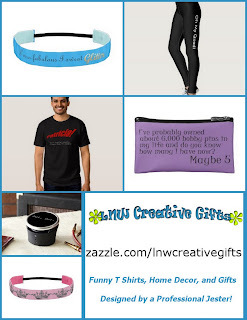 I would love to have you join my link party, Show & Share! I love this! Such a great idea. I'd love if you'd share it at my blog hop this weekend.Hope you can join in! Great project! Thanks for linking to 2nd Time Around! Great idea for using leftover vinyl. Your floorcloth looks great and your model looks so sweet. 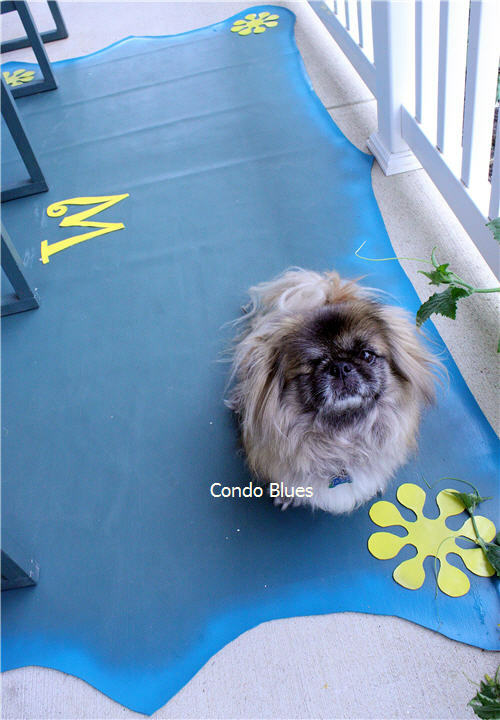 What a cute floor cloth and even cuter pooch! :) Thank you so much for linking up at Savvy HomeMade Monday and I hope you will come back and party again! Thanks again for linking with us at Show & Share!